Embedded systems have become immensely powerful and complex over the last decades. They can be found in almost all areas of human life. These systems have increased not only in their importance and complexity but also in the number of requirements they must meet in order to be functional. These requirements can be separated into functional and non-functional properties. Functional properties define specific behaviour and functions. Non-functional properties define the overall qualities or attributes of a system. Examples are security, performance, power consumption, thermal behaviour, or reliability. The model-based development approach contributes managing the complexity. 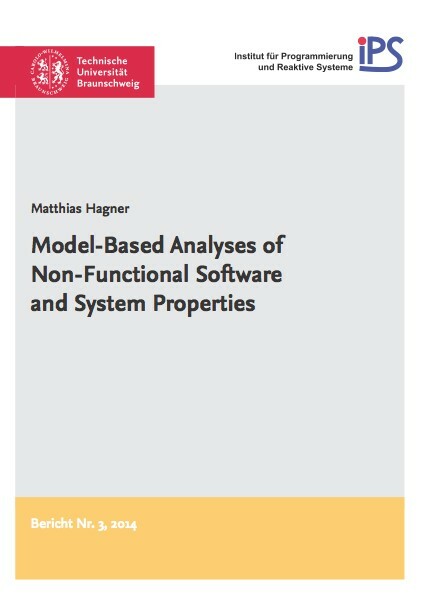 The analysis based on development models of the aforementioned non-functional properties, however, is not sufficiently supported. Analysis tools exist only for some non-functional properties and, if existing, are not well connected to modern development processes. However, if there is no verification of non-functional properties in early development stages, design decisions may result in a failure to fulfil these requirements which can doom the success of the entire development. To integrate the analysis of non-functional properties into a UML-based development process and consequently to enable early development analysis using corresponding analysis tools or algorithms, a specialised model is created in this thesis, the Analysis Model. This model contains all necessary information for different methods of analyses of non-functional properties. Based on this Analysis Model, specialised views for different kinds of non-functional property analyses can be instantiated. The Analysis Model with its specialised views is separate from the design to help the developer concentrating on the different properties. Additionally, this thesis presents an approach how to integrate the Analysis Model and the various non-functional property analyses into a development process. This includes methods to perform the analyses based on the views. Furthermore, an automatic creation and synchronisation of the Analysis Model based on the UML Design Model is presented. This thesis’s approaches are illustrated on the development of an ultrasonic analyser for wood-plastic composites. This embedded system has real-time, thermal, and power consumption requirements that are to be observed.